The new container handling system to be launched at TOC Europe in June will dramatically improve the efficiency of terminals when handling empty freight ISO containers and has considerable safety benefits. “By deploying BLOKs the whole container handling system can be speeded up dramatically using existing cranes and terminal infrastructure,” says Selwyn Rowley, head of sales and marketing for BLOK-Container Systems. It is possible to raise lifting rates from a present average of 30 containers per hour, to between 120 and 240 per hour, a massive increase in productivity. The BLOK Container System works like this. Containers are formed into blocks (‘BLOKs’) before the ship arrives during normal working hours. BLOK-Locks work alongside SATs to pre-lash the containers together in one secure BLOK ready for shipping. The BLOKs are then transported to the quay and craned onto the ship in BLOKs of four, six or eight containers. The BLOKs are assembled two containers high ‘off quay’ by teams of stevedores using a special self-jigging trailer called a BLOK Trailer. The BLOK Trailer once loaded, is towed to the quayside by just one driver, one tractor ready for lifting. 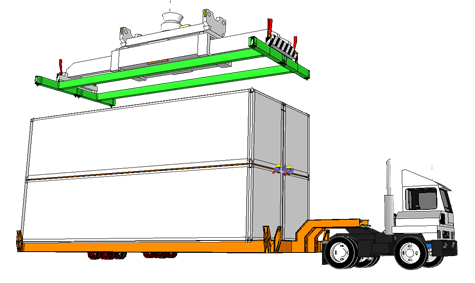 A BLOK-Spreader is available which for a four BLOK System enables tandem spreaders to lift three or four columns of containers, a twin lift spreader to lift up eight teu, and a single spreader to lift four 20 foots or four 40 foots at a time. The BLOK Container System will increase productivity by multiples of four, six or eight times. BLOKs can be assembled ahead of time, providing a balanced work load which allows stevedores to work easily and safely during normal working hours.